IF U.S. PRESIDENT DONALD TRUMP CAN BE ATTACKED AS "HITLER" (called racist, hater, genocidal dictator) it's because the WW2 propaganda lies about Hitler have never undergone rational discussion in the general public, been treated with objectivity, and in so doing been discredited. Instead, even those on the political right, the “conservatives”, White nationalists and White identity groups and individuals in general have quietly caved in to the “Holocaust” narrative for all these years. The crass lies, false rumors and wartime fake intelligence reports continue to be spread via the (((media))), (((entertainment outlets))), (((academia))) and (((publishers of history books))) with minimum resistance. This cowardice in standing up against this trash-talk is responsible for the situation we're in now in the U.S. and Europe – with a historically ignorant, brainwashed population convinced that to protect and strengthen one's nation, to show preference for those residing within your own national borders in the same way you show preference to your own family members over strangers, the same way you safeguard your home against intruders, is wrong, even evil, because it's “what Hitler did.” And look what happened there. We can't have it both ways. We can't join in the repudiation of Hitler, the world's most famous nationalist, and successfully fight against the repudiation of Trump on the same grounds. For this reason, I hope this post will be instructive to remind all my “conservative” friends and fellow-travelers just how this propaganda was created by the enemies of the White race. Adolf Hitler was not the enemy, as so many Whites today believe he was. There is no bigger enemy to our interests, then and now, than the World Jewish Congress (WJC), currently headed by Estee Lauder cosmetics heir, billionaire Ronald Lauder. That's why I am continuing to write about this organization. In this post, I have selected the information from a page at heretical.com by Udo Walendy, German author and historian born in Berlin in 1927 (and still living). The sections in boldface indicated by Walendy are direct quotes with page numbers from the World Jewish Congress document Unity in Dispersion, a History of the WJC . My own comments are in dark red. I have underlined words and sentences I believe are most worthy of special consideration by the reader. My intention is to show the instrumentality of the WJC in crafting, propagating and upholding the Holocaust Myth, or the 'Lie of the Gas Chambers' in order to inflict great and lasting harm on the German people and nation. I also want to bring attention to the WJC's efforts to stamp a “national character” onto world Jewry (even though they are dispersed into other nations and will continue to be), while at the same time working for the success of a geographical nation state for Jews, ie. Israel. This particular type of dual-citizenship is a special status enjoyed by no other people in the world. In both of these areas, the World Jewish Congress has from the beginning worked against our interests – the interests of White European-derived peoples. In order to emphasize the documentary character of this publication, we left largely without commentary our examination of the very important document on the World Jewish Congress ( Unity in Dispersion, a History of the WJC , published in New York in 1948. The WJC is a permanent world organization. Joint efforts to improve the living conditions of Jews* living in the “Diaspora,” i.e. outside Palestine. A Zionist Conference held in Carlsbad [Bohemia] in 1922 determined that a Jewish world organization should be created to deal with world politics. In 1932 the first preparatory conference of the WJC convened in Geneva. Preconditions had already been fulfilled during WWI – predominately US Jews had assumed leadership of worldwide Jewish interests in 1919 in Versailles. … a great number of Jewish delegations from many lands had found their way to the French capital. b) Influence on international law to restrict the sovereignty of a state. Although Poland never complied with the above, nor did Czechoslovakia or Lithuania. It was aimed at Germany. After the peace conference ended, the committee decided to continue as a permanent panel under the chairmanship of Dr. Leo Motzkin. It exercised influence at International Minority Congresses and at the League of Nations. ‘It is to establish the permanent address of the Jewish people; amidst the fragmentation and atomization of Jewish life and of the Jewish community; it is to establish a real, legitimate, collective representation of Jewry which will be entitled to speak in the name of the 16 million Jews to the nations and governments of the world, as well as to the Jews themselves.’ (p 33) [In other words, it was a move to leverage scattered Jews into a single power bloc, a “nation” for all practical purposes, but living within other nations (therefore the need for minority rights)]. The Conference elected an Executive Committee, in which Dr. Stephen Wise and Dr. Nahum Goldmann (shown at left in 1942 -Goldmann on left) were entrusted with leading positions. 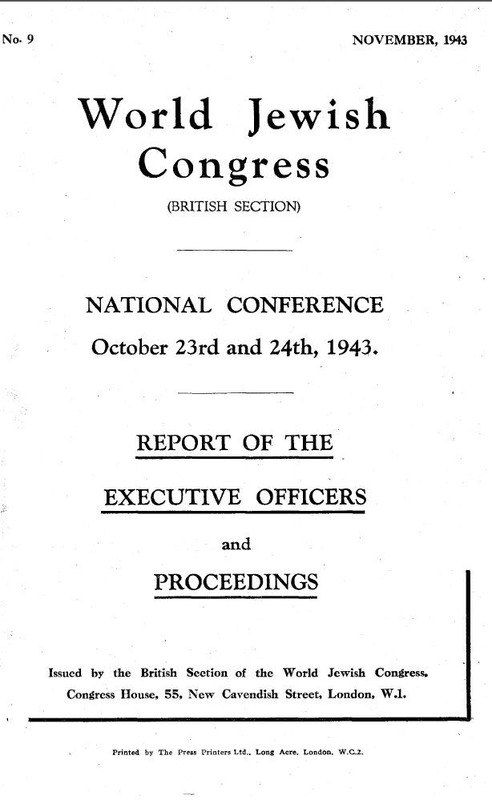 During 5-8 September 1933 and 20-23 August 1934 the second and third preparative conferences convened. In the meantime, the rise to power of National Socialism had become the crucial subject at these conferences. 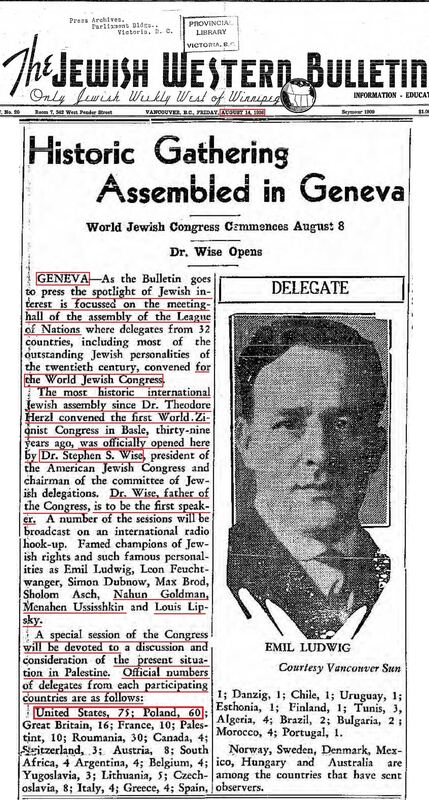 The official founding of the WJC took place in August 1936 in Geneva, Switzerland with 180 delegates from 32 countries in attendance, but none from Germany or the Soviet Union. [The vast majority of delegates came from 2 countries: the United States (75) and Poland (60) Several countries were represented with only one delegate.] Nahum Goldman announced that the existing sovereignty of nations should be considered obsolete. The League of Nations should be reinforced to safeguard the interests of the weaker groups in the world. Boycott and secret intelligence service used as political weapons. When World War Two erupted, the WJC headquarters were moved to Paris, and in July 1940, to New York City. The Geneva office continued to exist under the management of Dr. Gerhard Riegner and Dr. Abraham Silberschein, maintaining contact with German-occupied countries and the International Red Cross. In 1941, the “Institute of Jewish Affairs” was founded as a section of the WJC, provided with a staff of scientists, and assigned the task of gathering information from all parts of the world concerning Jewish affairs with the aim of submitting a Jewish peace program to the peace conference at the end of hostilities. The Institute did not consider the period from 1919 to 1939 as “peacetime,” but as an “armistice” or at most a “post-war situation” (pp. 136-137). As early as 1942, the “punishment of war crimes” had become a central question, and the necessity was stressed that a basis should be created on which crimes could be punished retroactively as from 1933. Jacob Lestschinsky, Balance Sheet of Extermination . III. The Responsibility of Individuals and Organizations (translated from the German original). The Jewish migration on the European continent to be expected as a result of the war. The emigration of Jews from Europe to other parts of the world, including mass settlement in Palestine, were discussed, along with the problems of the Jews who could not be repatriated (p. 146). Jewish claims for future peace settlements and participation therein. ‘In December, 1944, Dr. Kubiwutzki sailed on a mission to the European continent, being the first Jewish emissary from overseas to arrive in Belgium and Switzerland since the outbreak of hostilities, and one of the first to visit France. ‘Direct contact between the British Section and the continent of Europe began in November, 1944’ (pp. 132-133). 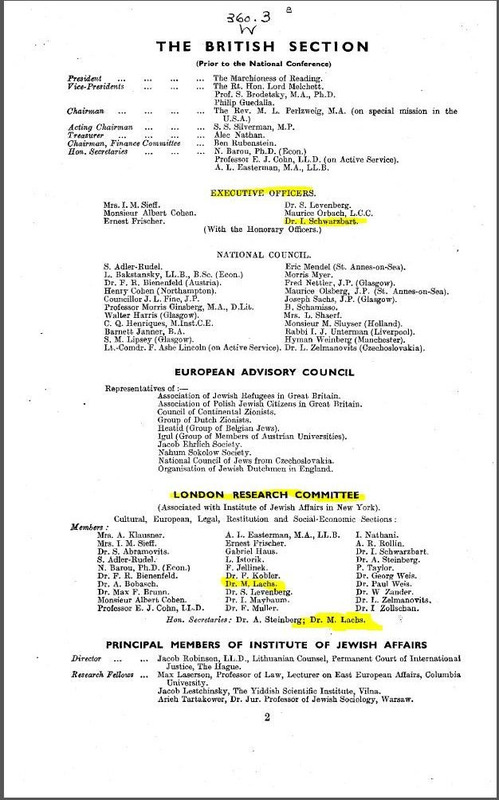 Thereupon the British section of the WJC organized on 29 June 1942 its own ‘Conference of the Press of the Free World,’ where the “Facts of a Systematic Extermination of European Jewry” were announced. What “facts” these were is not revealed in the conference minutes. ‘The Jews were Hitler’s first victims, and ever since they have been in the forefront of resistance to Nazi aggression’ (p.161). The WJC commented that “This sentence [of Churchill's] rightly characterized the Jews of whatever nationality as an allied people of the United Nations” (p. 240). 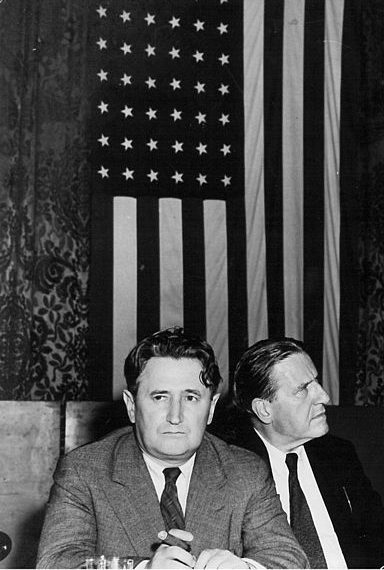 Equally important, but not mentioned in the diplomatic papers, is certainly the creation of a ‘World Anti-Nazi Council to Fight for Human Rights.’ [Note the term Human Rights, ie “humanity] It was founded in 1936 by Samuel Untermeyer together with the British unionist, Sir Walter Critine, to serve as an Agent for “psychological warfare” and – concealed from the public – to be financed by the Jewish Defense Fund. Winston Churchill became one of its activists. Great Britain and USA convened the so-called Bermuda Refugee Conference. It seemed that this conference was in fact dealing with the “refugee problem” and not with the rescue of Jews. The representatives of the Jewish organizations were even refused participation (p. 146). Neither the sending of food into the ghettos nor a liberalization of the immigration policy on the part of the US or Palestine was discussed at this conference. Members were the Secretary of State, the Secretary of the Treasury and the Secretary of War. The Director of this panel was Henry Morgenthau’s deputy, John W. Pehle. The War Refugee Board was the result of constant encroachment upon the US administration by the WJC. The two continued to be in close contact, and relations between the WJC and the military commands were likewise very good. ‘However, it was in vain that it endeavored since June, 1944, to have the instruments of annihilation – the gas chambers, the gas vans, the death baths, the crematoria – attacked in force either by the underground fighters or by Allied paratroopers. Neither did the Congress succeed any better in this respect in its negotiations with the Soviet Embassy, nor were E. Frischer, A. Reiss, and Dr. I Schwarzbart more successful in their conversations with the Czechoslovak and Polish Governments, respectively’ (p. 167). The peace conference which opened in Paris in August 1946, and ended on 10 February 1947 with peace treaties for Bulgaria, Finland, Hungary, Italy and Rumania, had attracted numerous Jewish organizations. On 20 August 1946 the WJC handed over a written declaration in which it demanded the fulfillment of numerous Jewish claims. The large powers recognized that the “Jews were the victims of racial and religious persecutions” but Jewish delegations were not admitted to the peace conference (p. 257). ‘There was a general lack of interest on the part of the non-Jews in those aspects of the Jewish problem which relate to international protection of Jewish rights in the peace treaties’ (p. 258). 2. Archiv Peter, Colburg: D. H. T. chapter: The participation of the Jews in the Second World War and their co-responsibility for the final solution of the Jewish question. 3. Nahum Goldmann, Mein Leben - USA, Europe, Israel (München 1981), pp 53, 66-67, 116. 4. Dirk Bavendamm, Roosevelts Weg zum Krieg (München – Berlin 1983), p. 310, 1956. A well-researched and thorough coverage, Carolyn. The time and dedication spent on this is much appreciated, and is a valuable contribution to our efforts to awaken the sheep and to educate!! Thank you! The research was done by Udo Walendy, Ray, so I can't take credit for it. What I've done is try to bring attention to the parts, from what he wrote, that I think are most valuable for the average Joe (or my correspondent "Joe", haha) to understand. And, of course, I'm looking to back up my position that the World Jewish Congress was a key player in fomenting the Auschwitz Myth of a Jewish genocide via gas chambers. Didn't happen. And that they're still the major upholder of the "Remembrance" campaign to keep the Myth alive. Here's an example of the type of reports issued by the WJC to the governments and media. I decided not to add it to the article which was already quite long, but thought I might put it in a comment. Notice the lack of any specific details that would prove what was being claimed. A detailed report of the liquidation of the smaller Jewish ghettos in Poland by the Nazis during last May and June was received here today by Dr. Ignacy Schwarzbart [mentioned in the article above], a deputy in the Polish National Council. The report says that the ghettos in Piaski, Komskowole, Siedlice, Lukow and Radzyn were wiped out. In the town of Wlodawa 4,000 Jews – 1,000 of whom had been sent there from Lwow since May – were divided into two contingents of 3,000 and 1,000. The 3,000 were sent to the Sobibor concentration camp, and most of the 1,000 were executed on the spot. Some of the latter, however, succeeded in fleeing to safety in the neighboring woods. Several hundred Jews were killed at Siedlice. In Wengrow 400 of the 700 Jews in the city were executed in the ghetto and the other 300 were gassed in the Treblinka “death camp,” the report discloses. Several hundred Dutch Jews recently arrived at the Trawniki camp, it is also revealed in the underground report. Children, women and aged men were sent to the Sobibor camp, while able-bodied men were placed in workshops manufacturing clothes for the German army. The report pays tribute to several Polish individuals and families who have been executed by the Germans for the “crime” of either sheltering Jews or feeding them. Curtis B. Dall was FDRs son-in-law and his mother's lawyer. His son Curtis D. Roosevelt died recently in France at the age of 86. He changed his name from Dahl to Roosevelt ro get a leg up in society and the UN diplomatic corps and because as a globalist he probably wanted to distance himself from his right wing father. Col. Curtis B. Dall was a stock broker at Merill Lynch and wrote an interesting book: FDR My Exploited Father-In-Law and a 78 page essay entitled Israelis' Five Trillion Dollar Secret. These are available on Amazon and provide insights into the Jewish influence on Franklin Roosevelt from a critical insider's perspective. My Exploited Father-in-Law can be read online here: http://vho.org/aaargh/fran/livres4/dall.pdf So I just started reading it. I read chapters 10 through 14, 16 and 20 Really interesting, I highly recommend it. I'll try to read more of it. It's really too bad works like this are stifled. for bringing the interesting article by Walendy. It gives a telling insight in the thinking and goals of WJC over time. After downloading the mentioned pdf I started reading it straight away - a seemingly interesting read, which will take me a while. As a German, born in 1939, I feel that the truth of the 2nd 30-Year-War and the following developments away from any peace treaty and the Holocaust never will come out. Instead, my homeland is becoming more and more a pariah state by all sort of willing helpers of Jewry - including treasonous "Germans". The situation is far worse than Weimar. "This cowardice in standing up against this trash-talk is responsible for the situation we're in now in the U.S. and Europe – with a historically ignorant, brainwashed population convinced that to protect and strengthen one's nation, to show preference for those residing within your own national borders in the same way you show preference to your own family members over strangers, the same way you safeguard your home against intruders, is wrong, even evil, because it's “what Hitler did.” And look what happened there." You summed it up beautifully, Carolyn! I came to this same conclusion too but just could not put into words. It is precisely the predicament we are in! Also, I'd like to take this time to thank you for all the work you've done in the past, continue to do and what you will do in the future.